Dogs are considered man’s best friend. Every time you come home they get so excited just to see you again. Cats? They don’t particularly care because they know they can survive on their own. Kind of like me without a man. Felines seem to come with individual personalities. Such is the case with the herd at the Dancing Dog Ranch. The dog lies around all day; it’s the cats that rule the roost. 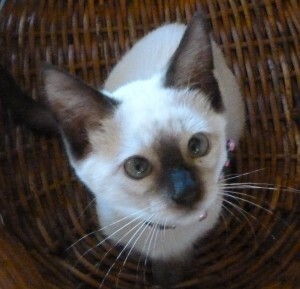 Our newest member of the family is Sammy the Siamese cat. I refer to him as “Samino!” because everything he gets into around here requires a “No!” But my favorite name for him is The Siamese Terrorist. He’s a master of terror. Whether you walk around the corner and get assaulted or you’re simply trying to shave your legs in the shower, The Siamese Terrorist always lies in wait to spring an attack. This 5-month-old monster has broken more things than he’ll ever be worth. My stock portfolio now consists of Super Glue dividends. Take this insider trading tip: the way Samino breaks things; they’re going to have a record year. My only hope is that he will grow out of it. After a recent operation at the vet’s office, I was assured fixing him would calm him right down. I want my money back. Unfortunately, my dream of a peaceful lap cat may never come true. In fact, the colder weather seems to make him even crazier. But all is not lost. I do not suffer alone. My Crazy Cousin has her own problems with one freaky feline. The Siamese Terrorist now has an official cat cousin. His name is Barklay the Barbarian. What’s BTB’s problem? He has a fondness for chewing wires. And you can’t Super Glue a wire back together. Well, you could, but it wouldn’t fix anything. No, Barklay the Barbarian strikes at the heart of the 21st century home: electronics. He has a well known penchant for small electronic cords such as those that connect iPods to Earbuds and hearing aid receivers to HDTV. Recently, he decided that the wires connecting the keyboard to the computer must go. Two Star Husband did the right thing. Instead of disconnecting the cat, he chose to go wireless. But now Barklay the Barbarian has stepped up his assault on this overly connected world. In a completely stealth attack, where no one would ever look, he found a way to get behind the desk and bite the wire connecting the backup external hard drive to the computer. This is where it gets tricky. He chewed just enough of the wire to make the system appear functional though, after a quick check, it appears no data was collected over several months. His moderately technology-challenged parents took awhile to figure out what was happening. Discussions about a visit to the dentist are being held as we speak. Where will BTB strike next? What small cord to something expensive will cause him to start drooling for a nice little nip and a slight current tingling through his lips? Only time will tell but the checkbooks are at the ready. Frankly, it’s much cheaper to deal with a nip on the toe when you’re shaving your legs. Say, maybe that’s why people prefer dogs to cats because, with dogs, their bark is always worse than their bite. Not so for the hissin’ cousins. Spreading laughter throughout the world…one hiss at a time.